This may mark a significant slowing of bilateral trade negotiations with other countries, given that it seems unlikely that countries will want to finalize a deal before seeing the final form of the border-adjustable tax. Other areas that may slow negotiations include: details of the U.S. position on currency manipulation will not become clear until at least April, as discussed in Panjiva research of February; ways to operate outside WTO rules are being investigated; and the 90 day NAFTA consultation has not yet started, which Canada and Mexico want to be bilateral talks. The latest trade deficit for January including services is not due until March 8, though the advanced goods deficit expanded to $69.2 billion compared to economists’ expectations of $66.0 billion. 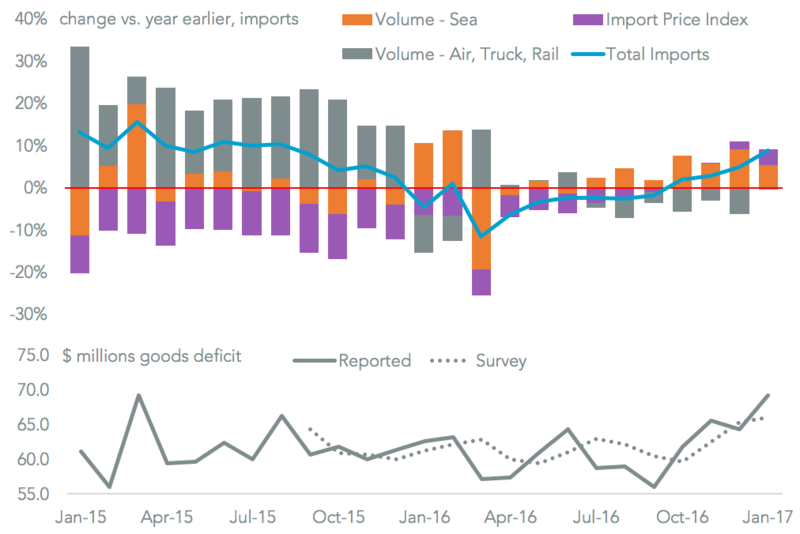 Imports of goods have contributed to an expanding deficit in nine of the past 12 months, adding fuel to Trump administration’s aims to clamp down on them. The U.S. advance trade in goods deficit was $69.2 billion in January, according to official figures, the highest since March 2015. It was also wider than the $66.0 billion expected by economists, according to Bloomberg (paywall). As previewed in Panjiva research of February 24 this includes an expansion of both imports, by 8.9%, and exports which were 8.3% higher than a year earlier. Both were led by an expansion of seaborne shipments. Calculations for U.S. imports combining Panjiva import volumes with BLS’s MXP index change. Lower panel shows advanced goods deficit from U.S. Census Bureau – dotted line shows MarketWatch reported consensus. While the expansion in imports on a year earlier was likely the result of higher-than-expected oil prices, which has also impacted Mexico, it was a short term rise in consumer goods imports that may have led to the surprisingly high deficit. These expanded by $2.38 billion, or 4.8% compared to the prior month, including an expansion in toys. All the major categories expanded, however, adding some credence to the concept that imports were accelerated ahead of the risk of new taxes or tariffs. The expansion in exports was partly driven by increased oil products sent to Mexico compared to a month earlier. These may reverse once the country’s production problems are sorted out. The auto sector also expanded with a 9.3% expansion outstripping the 2.9% rise in imports. That may swap around in February given the U.S. exports parts and imports completed vehicles. The full deficit, due on March 7, will likely be the one that gets more political attention than the advance release, while future figures may also include a redefinition of re-exports. Globally, managers have become more optimistic about the near-term outlook for trade. The latest CFPL survey of Chinese managers export expectations increased to a level not seen since July 2014 and not beaten since April 2012. It comes at the same time as import expectations reached their highest since March 2011. Across the Pacific U.S. managers surveyed by ISM increased their export expectations, but more importantly their import expectations increased by the fastest rate in a year. That suggests plans to accelerate imports ahead of new border-adjustable taxes or tariffs. With French and German managers also becoming more upbeat, the British are the only outliers ahead of Brexit. The 17th round of talks on the Regional Comprehensive Economic Partnership (RCEP) will be held this week in Kobe, according to Japan’s METI. While often characterized as a Sino-centric TPP, the RCEP is structured as a deal including ASEAN and countries with which it has free trade deals including China, Japan, India, South Korea, Australia and New Zealand. Talks have been ongoing since 2012, and while a completion is possible this year there is the potential complication of China’s National Congress in October. That may slow progress on a deal as the government becomes more internally-focused. Putting aside the geopolitics, China has a strong economic incentive to promote a deal. Its exports to 10 of the 15 RCEP participants fell in 2016. These include Japan (exports to which fell 4.1%) and South Korea (4.9% lower), the two largest other countries by total trade. 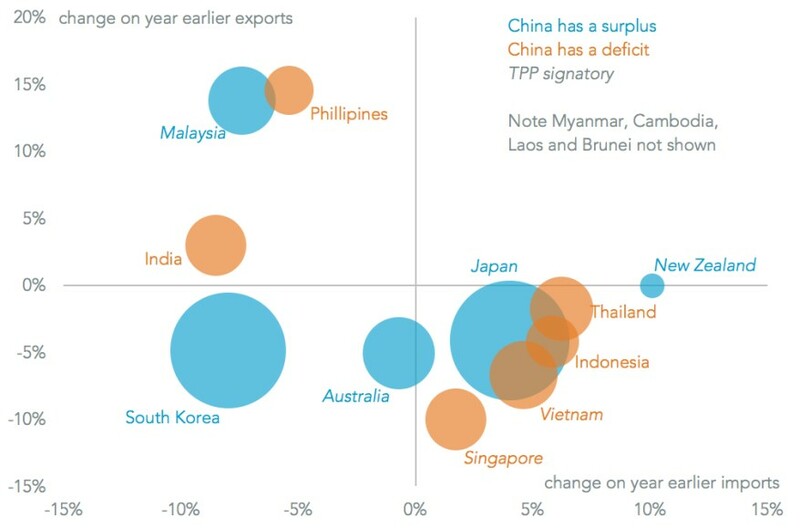 Additionally, four countries with which it has a deficit saw exports fall and imports rise. By scale of trade these were Thailand, Vietnam, Singapore and Indonesia. 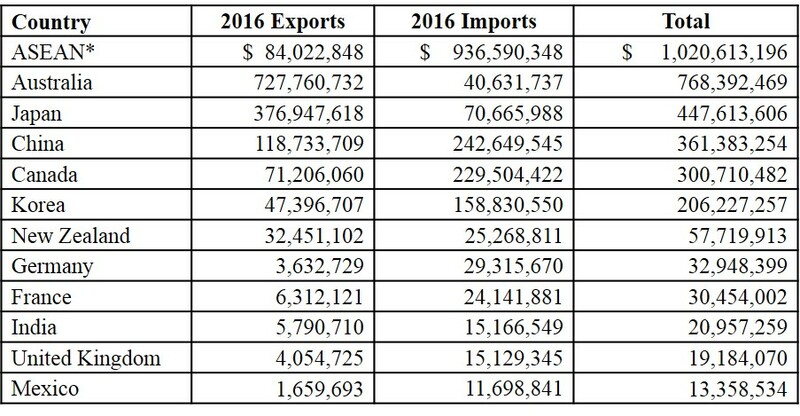 Chart segments Chinese exports and imports for calendar 2016, compared to 2015, by country of origin. Bubble size indicates total trade, bubble color shows whether China had a surplus (blue) or deficit (orange) while italicized labels indicate TPP participation. The office of the U.S. Trade Representative has published its annual report and overview of the President’s trade agenda. This is an outline document currently as USTR nominee Robert Lighthizer has yet to be confirmed. A large part of the document relates to sovereignty of trade policy, and essentially states that WTO rulings against the U.S. probably won’t be acted upon. The U.S. has been a heavy ‘user’ of WTO complaints. Panjiva analysis of WTO filings shows 47% of the 522 disputes initiated since 1995 have either been by, or about the U.S. The U.S. has been a net receiver of complaints, however, having been subject to 10% more complaints than it has made. 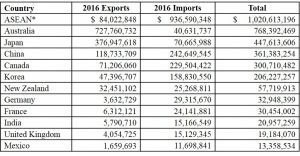 With regards to trade deal, Panjiva’s analysis of the top 200 U.S. export and import lines with South Korea shows the largest sensitivity for South Korea are in auto exports (20.8% of all exports in 2016) and for the U.S. it is aerospace (8.3%). Aside from that there are complex webs of supplier / customer relations – for example 4.9% of U.S. exports to South Korea are semiconductors, while 5.1% of South Korean exports are phones. Additionally, U.S. exports are a lot more diverse than those from South Korea – its top 20 exports account for 37.4% of the total vs. 53.9% for South Korea. When it comes to negotiations, then, South Korea has a few major pain points to defend, whereas the U.S. has many areas – particularly in agriculture – to defend.